I have little time to blog today, but lots to share with you this week, always the way isn't it?! Running through my mind are: details on the 'how to' get your own finds home from France, some 'finds' that I am working on at the moment for some lovely clients that I am sure you would love to see, ... and the end of a transformation of my own little fireside stool that has just has the rush seating re-done and I am about to collect today. I will have all of this and more for you shortly! So today I thought I would share this image which I have loved for a while. 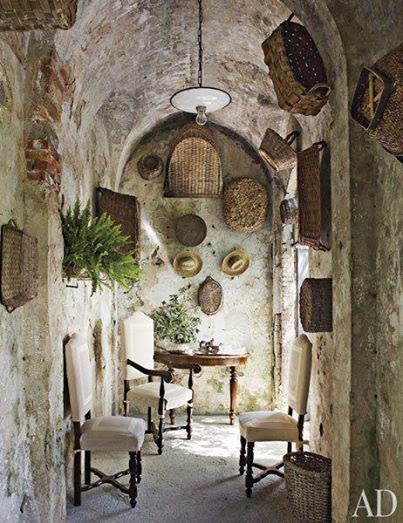 I have nowhere that I can replicate this in my own home, but I love the secret feel of this quiet passageway, ... the beautiful ancient stonework, turned into this seating nook. And there is so much to love in the detail - hats and baskets, chairs and table, each collected over time! This little hide-away...I love it! So peaceful and serene! Especially loving the neutrals here!